On March 5th 1770 nine soldiers met a crowd of angry colonists in the Street in front of the custom house. The Friday before 40 soldiers and 40 colonists had a big fight at a fisherman’s wharf. Everyone was still angry. At 8’00 o’clock the colonists and the soldiers met again this time there were only 9 soldiers with muskets (guns), and around 60 colonists armed with sticks. We know that one colonists struck one of the soldiers down and he fired his weapon. We know that 5 other soldiers fired their weapons. We know that 5 colonists died. We have examined the facts of the case. 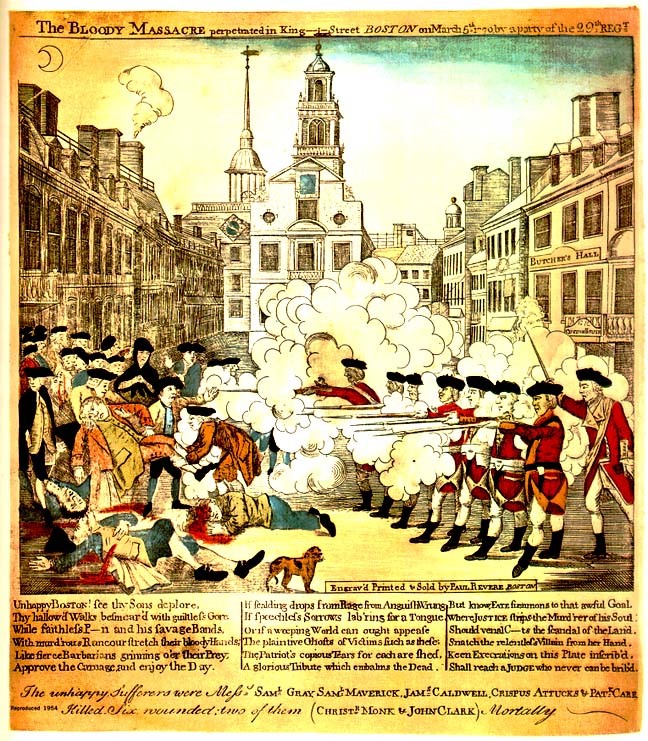 We know the Boston “massacre” was seen as murder by the colonists. The soldiers said it was self- defense. Tell me what you think. Was it self defense or was it murder? Were the soldiers every really in danger, or were they wrong to shoot? State your position first: I think it was Murder… or I think it was self-defense, then use the facts of the case to back this up. On the cold, snowy night of March 5, 1770, a mob of angry colonists gathers at the Customs House in Boston and begins tossing snowballs and rocks at the lone British soldier guarding the building. The protesters opposed the occupation of their city by British troops, who were sent to Boston in 1768 to enforce unpopular taxation measures passed by a British parliament without direct American representation. The previous Friday, British soldiers looking for part-time work and local Bostonian laborers had brawled at John Hancockýs wharf. After the brouhaha escalated to include forty soldiers, their colonel, William Dalrymple confined them to their barracks. Peace settled over the city during the two-day observance of the Puritan Sabbath. However, tempers on both sides were still flaring and no one expected Monday, March 5, to pass without incident. After sunset, the brawl between Boston civilians and British soldiers began again. When the customs-house sentinel called for assistance, a British corporal and seven soldiers came to his aid. Two of these reinforcements had been among the soldiers brawling on Hancockýs wharf the previous Friday. British Captain Thomas Preston assumed command of the riled Redcoats and ordered them to fix their bayonets. As the crowd dared the snow-pelted soldiers to fire, Private Hugh Montgomery slipped and fell, leading him to discharge his rifle into the jeering crowd. The other soldiers began firing a moment later, and when the smoke cleared, five colonists were dead or dying: Crispus Attucks, Patrick Carr, Samuel Gray, Samuel Maverick and James Caldwell. Three more were injured. Although it is unclear whether Crispus Attucks, a sailor of African and Indian ancestry, was the first to fall, as is commonly believed, the deaths of the five men are sometimes regarded as the first fatalities of the American Revolution. The British soldiers were put on trial, and John Adams and Josiah Quincy Jr. agreed to defend the soldiers, in a show of support of the colonial justice system. When the trial ended in December 1770, only two of the six British soldiers were found guilty of manslaughter. They were branded on the thumb and released. In advance of the Continental Army s occupation of Dorchester Heights, Massachusetts, General George Washington orders American artillery forces to begin bombarding Boston from their positions at Lechmere Point, northwest of the city center, on this day in 1776. After two straight days of bombardment, American Brigadier General John Thomas slipped 2,000 troops, cannons and artillery into position just south of Boston at Dorchester Heights. The 56 cannon involved in the move were those taken at Ticonderoga, New York, by Lieutenant Colonel Benedict Arnold and Ethan Allen with his Green Mountain Boys, which had then been transported to Boston by Colonel of Artillery Henry Knox the previous winter. By March 5, 1776, the Continental Army had artillery troops in position around Boston, including the elevated position at Dorchester Heights, overlooking the city. British General William Howe realized Boston was indefensible to the American positions and decided, on March 7, 1776, to leave the city. Ten days later, on March 17, 1776, the eight-year British occupation of Boston ended when British troops evacuated the city and sailed to the safety of Halifax, Nova Scotia. The victory at Boston resulted in John Thomas promotion to major general; soon after, he was assigned to replace General Richard Montgomery, who was killed in action as he and Benedict Arnold attempted to take Quebec. Thomas arrived at Quebec on May 1 and soon lost his own life. Although a physician by profession, he died of smallpox on June 2, as the Patriots retreated up the Richelieu River from their failed siege of the city.